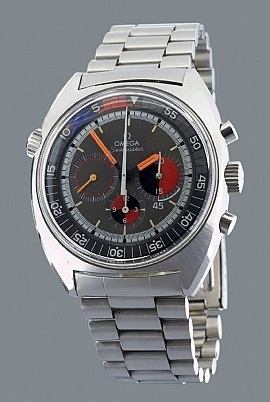 Omega was founded in 1848 in Biel, Switzerland, by Louis Brandt and is today part of the Swatch Group. The brand has participated actively in some of the most challenging and fascinating adventures in the human history. 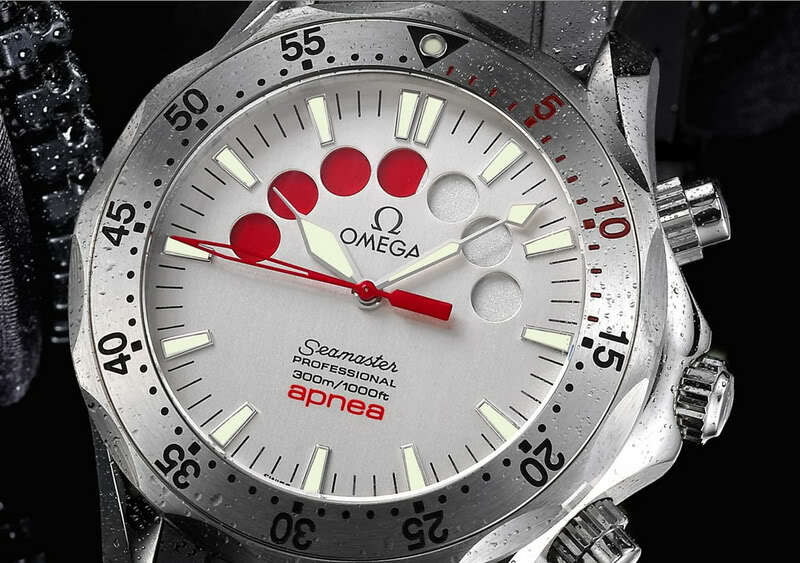 In 1932 Omega introduced the world’s first divers’ watch and the brand has been active in underwater adventures ever since. 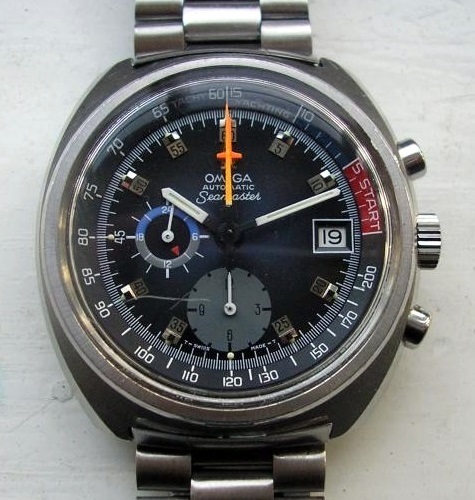 And who doesn’t know the Speedmaster which was strapped to the outside of Buzz Aldrin’s spacesuit, being the the first watch ever worn on the moon, on July 21, 1969. 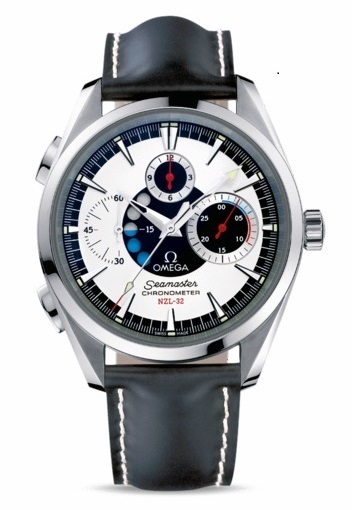 One of the earlier models related to sailing was the Omega Seamaster Chronostop , ref. ST 145.008, with an internal rotating bezel (via the crown at 10 o’clock) with a coloured 15 minute regatta scale that could be set for the regatta countdown. 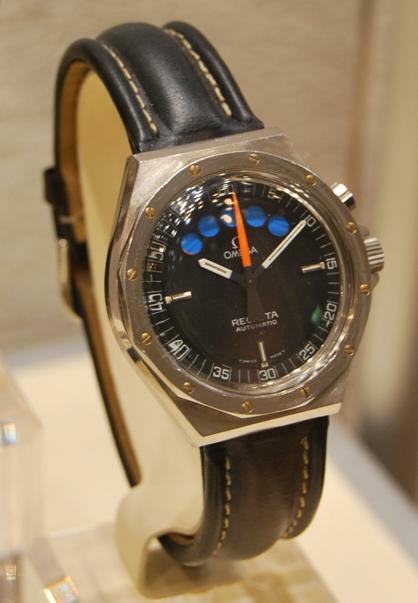 There was also an Omega Seamaster Chronostop Bullhead , ref. ST 146.011, with a 15 minute subdial, divided into 3 different coloured segments of 10 minutes each. 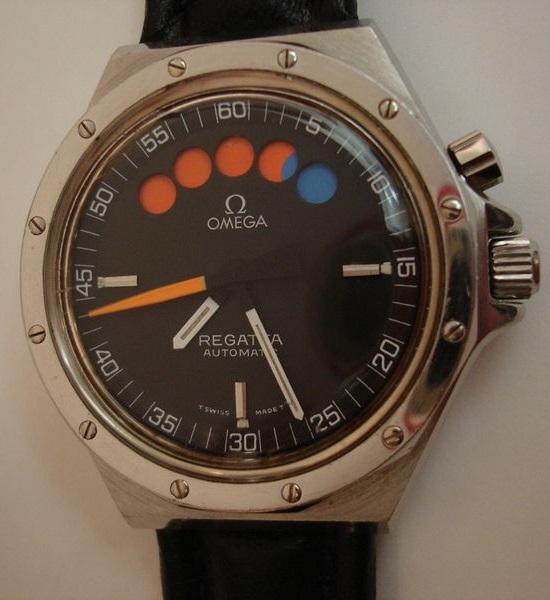 A bit of a strange combination is the later Omega Seamaster Soccer , ref. ST 145.019, also with a rotating bezel with regatta scale. Apparently for both soccer and for yachting? Omega Seamaster Chronostop, Chronostop Bullhead and Soccer, all with regatta scale. In 1930, Omega and Tissot united to form an important Swiss watch group, the Société Suisse pour l’Industrie Horlogére SA (SSIH). Though both brands remained independent, they were also joined in the group by Lemania in 1932 and the SSIH-group would eventually grow into the Swatch Group that we know today. It is therefor understandable that Lemania movements appeared in watches of all three brands, and also that Lemania produced some of the cases too. 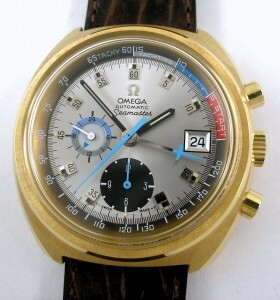 One example is the Seamaster Yachting (with Lemania 1341 = Omega 1040 movement) with a 15 minute regatta scale along the outer edge of the dial. Omega Seamster Yachting, in steel and gold-plated. 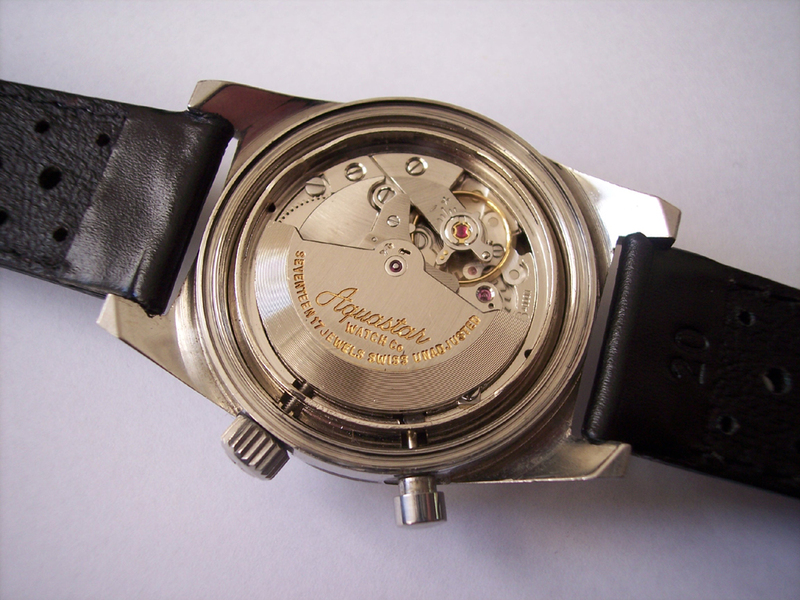 Caliber: automatic Lemania 1341 movement (Omega 1040). Case size: barrel shape 43 x 43 mm. 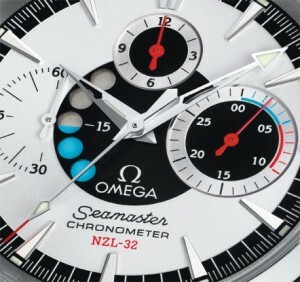 You can read an excellent review by Ilias Giannopoulos about the Omega Seamaster Yachting here. Only very rarely have I seen an Omega Regatta , with the Lemania 1345 movement as probably very few were sold. The left picture below was taken at the Omega museum. 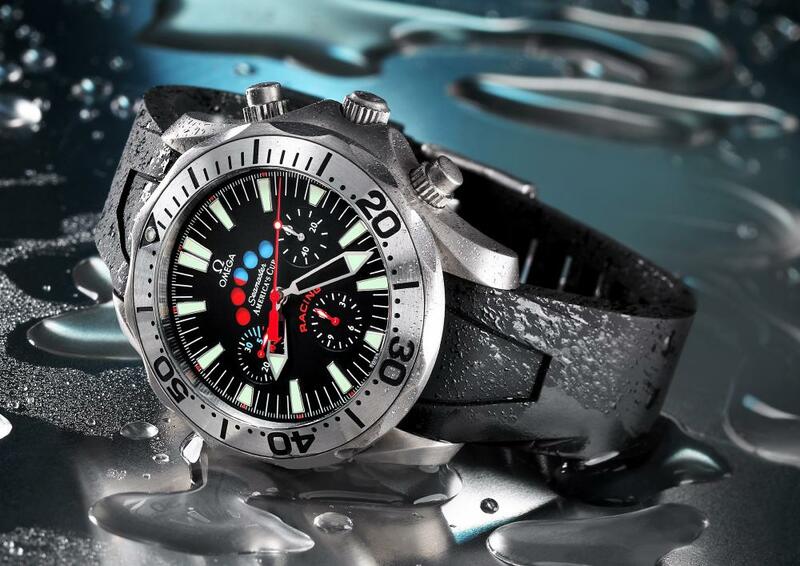 Like the Heuer version, Omega counts the seconds up from zero to 60, instead of down from 60 to zero as the Aquastar, Tissot and Lemania models do. The caseback is unbranded, and the rotor is signed ‘Lemania’. 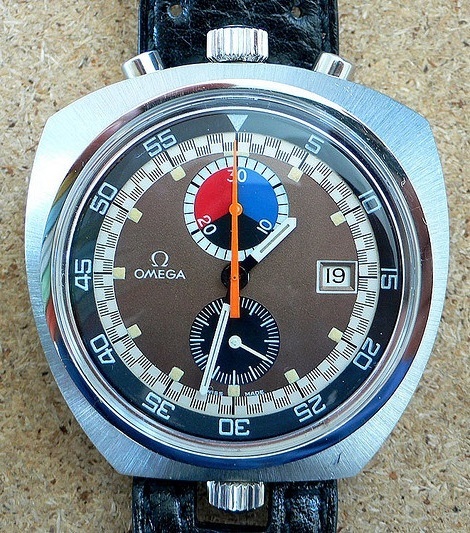 The Omega Regatta with Lemania 1345 movement. Caliber: automatic Lemania 1345 fly-back movement. Case size: Ø 42 mm / 15 mm. 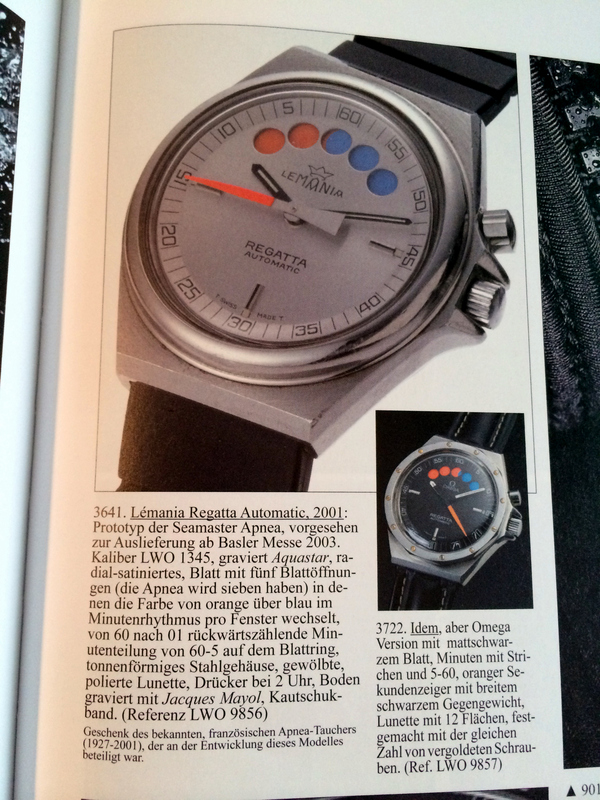 For a description of the Lemania caliber 1345 go to the Aquastar 1970′s section. In the book ‘Omega – A Journey Through Time’ by Marco Richon, the author explains that the Lemania Regatta was the forerunner for the later Omega Seamaster Apnea , the version with a 2×7 minutes counter used for diving. There’s also a picture of the Omega Regatta in this book. So far the only version I have seen is with a black dial and has golden screws. 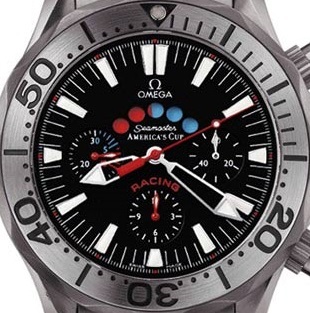 In 2003 Omega extended its Seamaster line with the Racing America’s Cup Chronograph , in celebration of the partnership with Team New Zealand and of its role as official timekeeper of the America’s Cup in 2003. 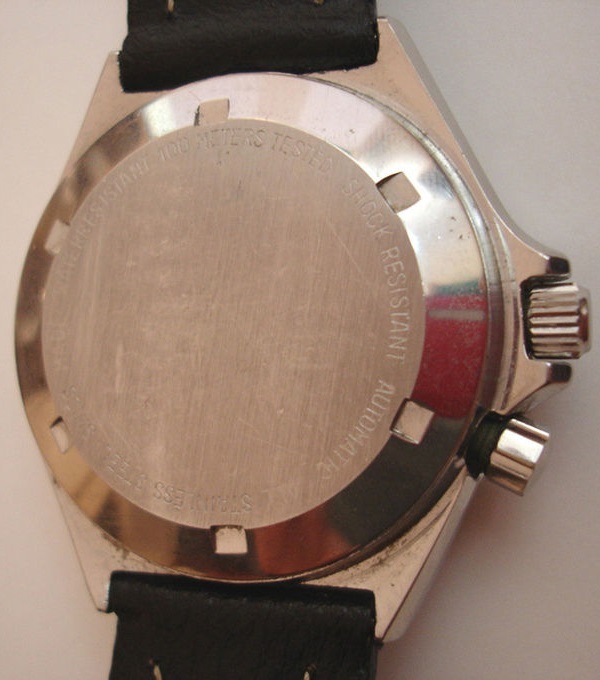 It was available in steel or titanium, with either a metal bracelet or a rubber strap with buckle. The watches were released by Omega as officially certified chronometer. 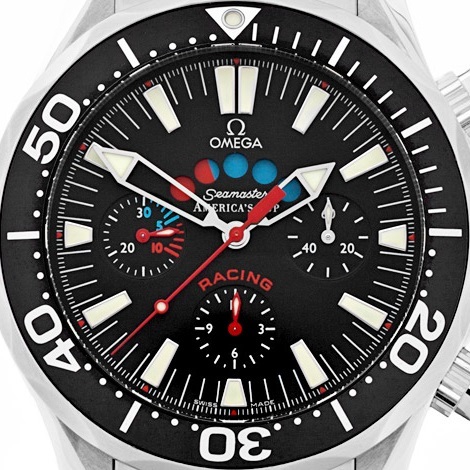 Omega Seamster Racing America’s Cup chronograph with steel case and rubber strap. 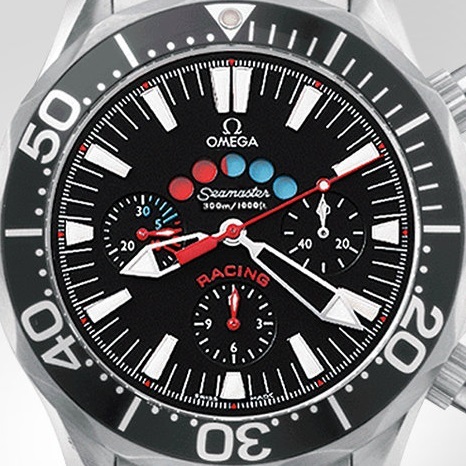 Model: Omega Seamaster Racing America’s Cup chronograph. 2569.50.00 steel case, black bezel and steel bracelet. 2869.50.91 steel case, black bezel and black rubber strap. Caliber: Omega 3602 (automatic ETA 2892-A2 movement with a Dubois-Dépraz 2027 regatta module). Case size: Ø 44 mm / 16,3 mm. A year later the model was replaced by the Omega Seamaster Racing 300 M , also available in either steel or titanium. 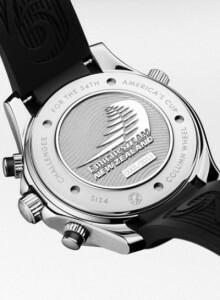 The only difference was on the dial: ‘AMERICA’S CUP’ is now replaced by ‘300 m/1000 ft’. Omega Seamaster Racing America’s Cup and Seamaster Racing 300 M.
Model: Omega Seamaster Racing 300 M.
Reference: 2269.52.00 titanium case, bezel and bracelet; phase-out 2008. 2969.52.91 titanium case and bezel, and black rubber strap; phase-out 2008. 2569.52.00 steel case, black bezel and steel bracelet. 2869.52.91 steel case, black bezel and black rubber strap. This Omega 3602 regatta movement differs from other timers as in addition to a regatta module, it also has a fully operational chronograph! It was developed by Dubois-Dépraz in 1993 and first used by Piquot Meridien, read here. The watch has the crown to set the time at 3 o’clock, and two pushers for the countdown and chronograph functions; one pusher at 2 o’clock for start/stop and another at 4 o’clock for reset. There are five round holes cut out of the dial, between 10 and 2 o’clock, and the indicator disk coloured black, blue, and red sits underneath. Besides the indicator disk the chronograph also has a large center second hand, a subdial at 9 o’clock with a 30 minutes register (of which the first 5 minutes are coloured blue, and the second 5 minutes red, just like the indicator disk), and a subdial at 6 o’clock with a 12 hour register. The subdial at 3 o’clock shows the running seconds. After the chronograph has been reset, the five dots on the dial turn black. When the chrono is activated the countdown starts, the sweep hand is set in motion and the indicator disk runs continuously clockwise. After one minute the first dot turns blue, and the 30 minutes register counts 1 minute. After five minutes all 5 dots are blue, and after the 6th minute the first dot turns red while the other 4 dots remain blue. And after 10 minutes all 5 dots have turned red. Unless you push the stop pusher and stop the chronograph, the indicator disk continues to rotate and so after another 5 minutes the dots are all black, and the cycle starts again. 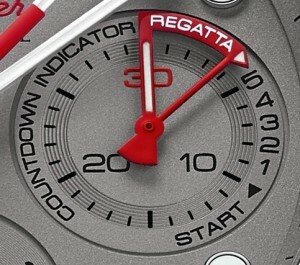 So the regatta countdown function can be used for a 10 minute start as well as for a 15 minute start. Size: 13,25″ Ø 30,00 mm / H 8 mm. Base caliber is an ETA 2892-A2 movement with a DD 2027 regatta module integrated. 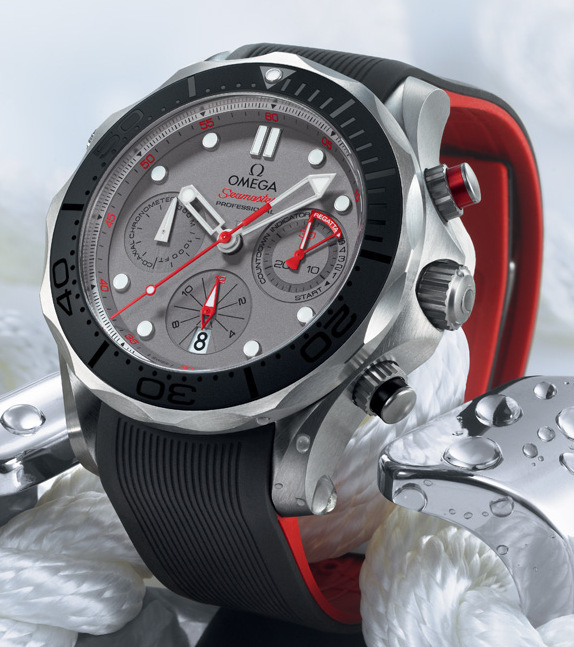 In 2006 Omega presented the Seamaster NZL-32 chronograph , named after the boat that won the America’s Cup in 1995, in honour of Emirates Team New Zealand and to mark its role as the team’s official watch. 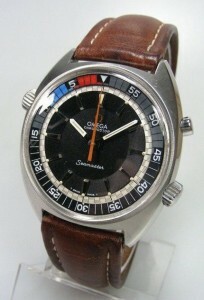 Omega Seamaster NZL-32 with steel bracelet or rubber strap. 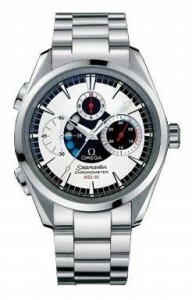 Model: Omega Seamaster NZL-32 Chrono 150 M.
Reference: 2513.30.00 steel case with steel bracelet. 2813.30.81 steel case with rubber strap. Case size: Ø 42,2 mm / 15,6 mm. Year: as of 2007/2010. Not shown in the 2010/2 catalogue. 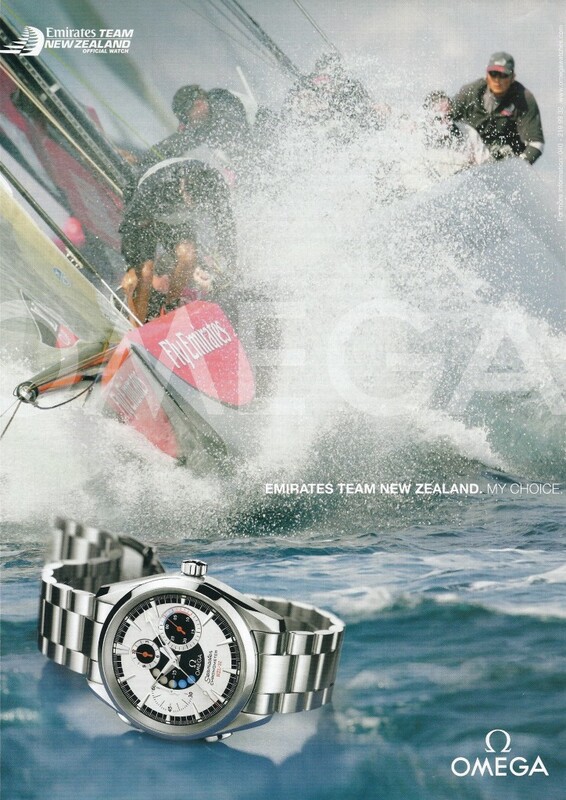 Ad for the Omega Seamaster NZL-32 chronograph, in magazine Nautique 3/2007. 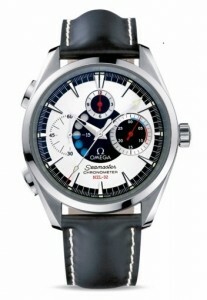 The Omega Seamaster NZL-32 Chrono 150 M is similar to the Racing models but has a more stylish case with a fixed bezel. 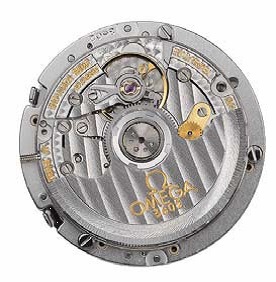 The movement is the same automatic Omega 3602, but the chronograph module is inverted so while the crown to set the time is still at 3 o’clock, the pushers for start/stop and reset are now at 8 o’clock and 10 o’clock respectively. The indicator disk isn’t black/blue/red on this model, but silver/blue/red as the dial is also in a silver colour. The five openings in the dial are not between 10 and 2 o’clock, but between 7 and 11 o’clock which makes the regatta countdown a bit more difficult to read, but in terms of its operation, it works the same as in the Racing models. 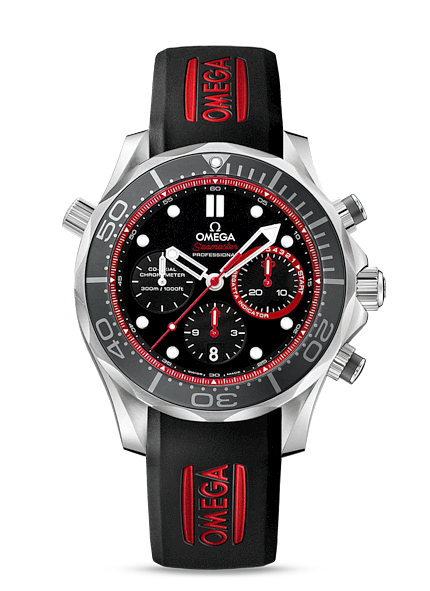 In 2013 Omega is again supporting the yachtsmen of Emirates Team New Zealand with their entry to the 34th America’s Cup in San Francisco, with the Seamaster Diver ETNZ Limited Edition. This special edition chronograph features a red five-minute countdown tracker on the 30-minute recorder at 3 o’clock, and is limited to 2013 copies. The watch is presented on a black rubber strap and comes with a stainless steel bracelet as well. 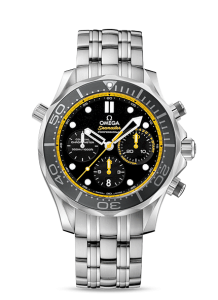 Also in the collection is an Omega Seamaster Diver 300M Regatta featuring a yellow five-minute countdown tracker on the 30-minute recorder at 3 o’clock, and is presented on a stainless steel bracelet. 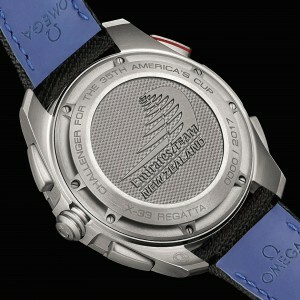 Omega Seamaster Diver 300M Regatta and the Seamaster Diver 300M ETNZ Limited Edition. Model: Omega Seamaster Diver 300M Regatta and Seamaster Diver 300M ETNZ Limited edition. Caliber: Omega Co-Axial 3330 automatic movement with chronograph function. Case size: Ø 44 mm / H 17,3 mm. Year: 2013, 2014, 2015, 2016, 2017. Subdial at 3 o’clock with 5 minutes regatta indicator. 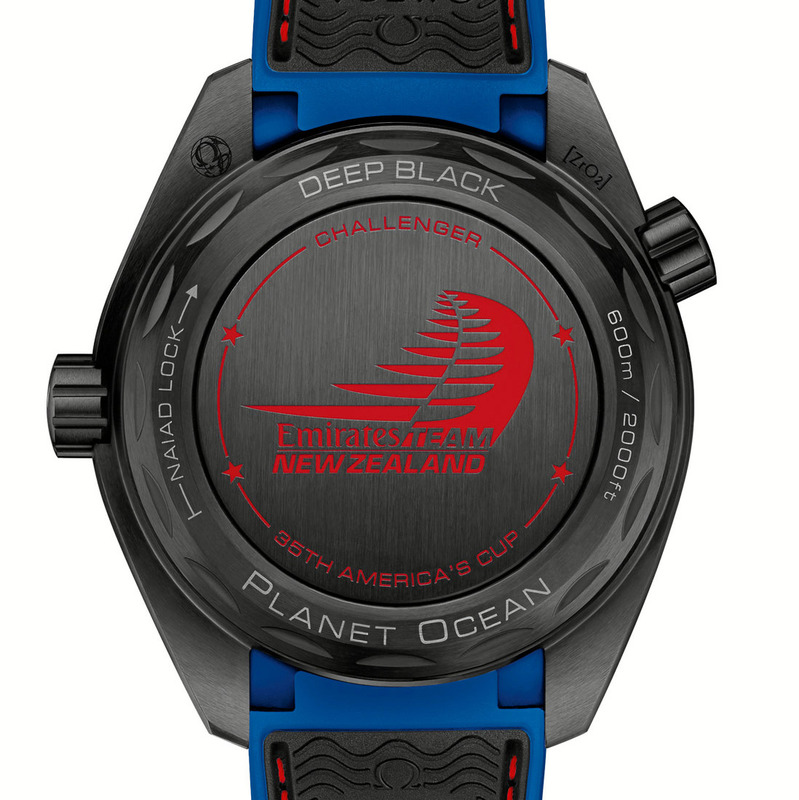 In 2015 Omega announced their continued sponsorship of the Emirates Team New Zealand and their challenge for the 35th America’s Cup in Bermuda in 2017. 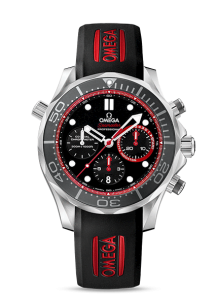 For this occasion Omega has launched a new version of the Seamaster Diver 300M ETNZ, with reference number 212.92.44.50.99.001. The watch has a titanium case with a black ceramic rotating bezel, a rubber strap, and a slightly different 5 minute regatta countdown indicator at the 3 o’clock subdial. In 2017 again Omega will be supporting Emirates Team New Zealand at the 35th America’s Cup in June, a partnership that began in 1995. 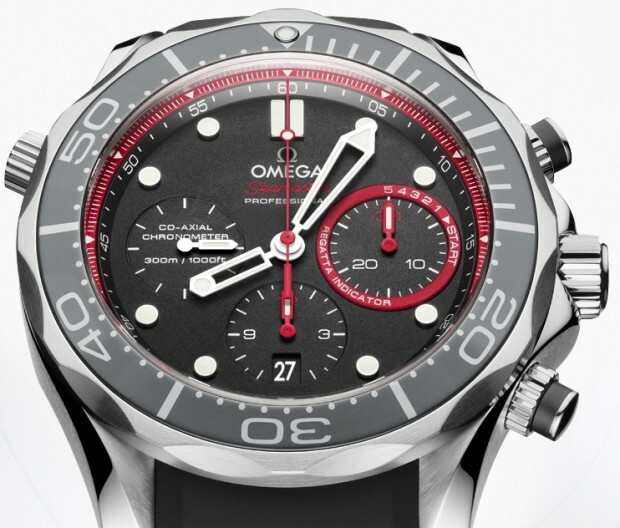 As part of this support for the New Zealand crew, Omega has unveiled two new timepieces. The first watch, the Speedmaster X-33 Regatta Chronograph with ref. 318.92.45.79.01.001, is the model that each crew member will wear during the race. It is powered by the multi-functional quartz chronograph movement, OMEGA calibre 5620, with regatta functions CTD (countdown) and RAC (race). The LGB (logbook) function allows two races to be recorded with 10 buoy recordings each. If you want to know exactly how it works, you can download the Instructions Manual here. The Speedmaster X-33 Regatta Chronograph is produced as a limited edition of 2017 pieces. 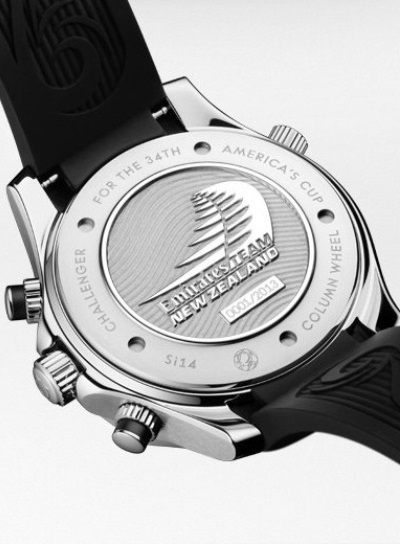 The caseback is stamped with an Emirates Team new Zealand logo and engraved with the text ‘Challenger for the 35th America’s Cup, as well as the limited edition number. 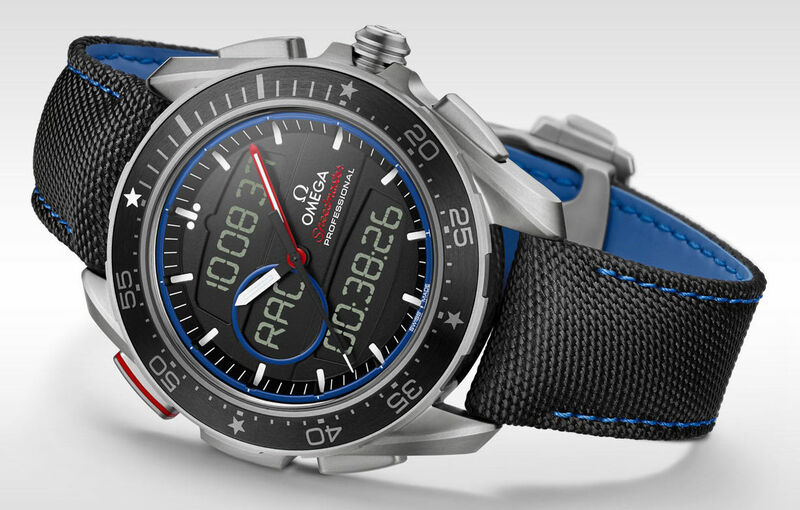 Omega Speedmaster X-33 Regatta Chronograph 45 mm, Limited Edition. 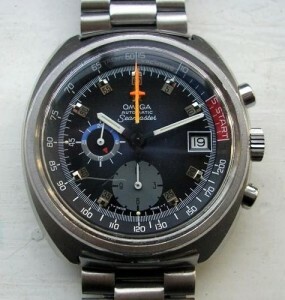 Model: Omega Speedmaster X-33 Regatta Chronograph 45 mm. Reference: 318.92.45.79.01.001. titanium case, black dial and nylon fabric strap. 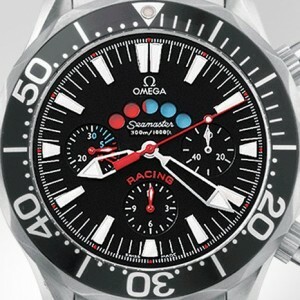 Caliber: Omega 5620 thermo-compensated quartz movement with special functions. Case size: Ø 45 mm / H … mm. 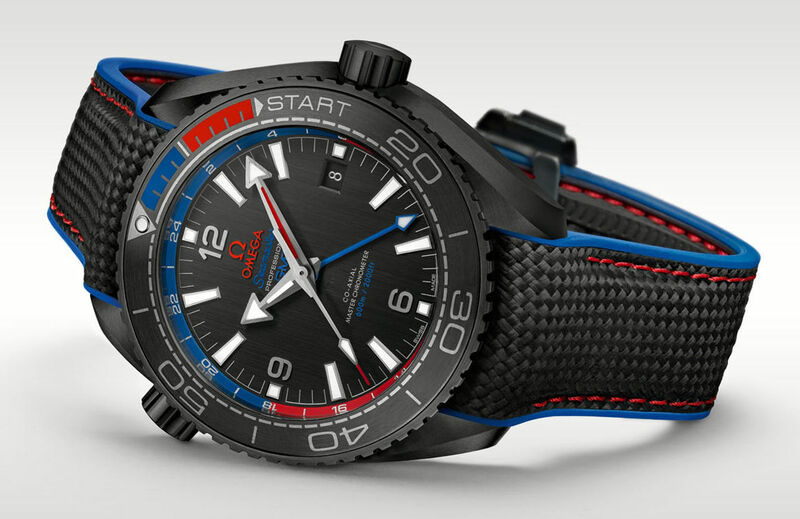 Omega’s second watch for the 35th edition of the America’s Cup is the Seamaster Planet Ocean ETNZ with ref. 215.92.46.22.01.004, based on the Seamaster Planet Ocean ‘Deep Black’ Master Chronometer (Certified Master chronograph, depth-rate of 600 meters, GMT hand, Helium Valve crown). Although this watch is not a real Regatta Yachttimer, it has an unidirectional rotating bezel with a coloured 15 minute regatta scale (last 5 minutes written START). The caseback of this Seamaster Planet Ocean ETNZ has a similar centered logo and engraving as on the Speedmaster X-33 Regatta. This time, the Emirates Team New Zealand has been engraved in red on the black ceramic caseback. Omega Seamaster Planet Ocean ETNZ. Model: Omega Seamaster Planet Ocean ETNZ. Reference: 215.92.46.22.01.004. black ceramic case, black dial and nylon fabric strap. Caliber: Omega 8906 self winding chronograph. Case size: Ø 45,5 mm / H … mm. Many thanks to Henrik (Heuerchrono.com) for the copied page from your Omega book. http://www.omegawatches.com/ and Omega’s official press kits.